A team of eight Dartmouth students was one of five finalists for NASA’s Breakthrough, Innovative and Game-Changing Idea Challenge, a competition that invites both undergraduate and graduate student teams to create aerospace design projects to solve real-world problems. 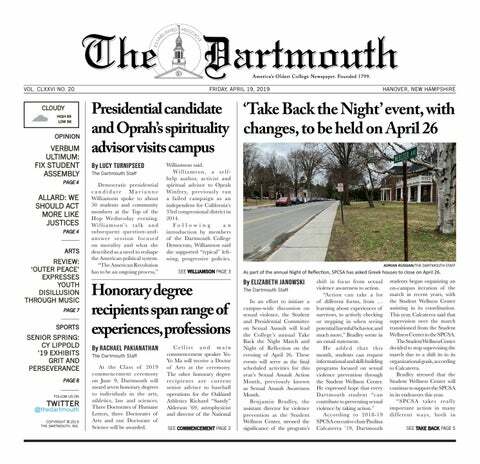 Last week, the College announced the launch of the “250 for Dartmouth’s 250” project. This initiative, in honor of the College’s 250th anniversary, calls for alumni to donate a total of 250 endowed scholarships to students in need of financial aid by the end of the year as a way to celebrate the milestone of the College’s founding. Endowed scholarships are established by donors and invested with the College’s endowment, thus ensuring that they retain their value in perpetuity. These scholarships would contribute directly to Dartmouth students and continue Dartmouth’s tradition of need-blind admissions. When Hurricane Maria struck in September 2017, Puerto Rico plunged into a blackout — one that would last for almost an entire year. As a child, Michael Brown, a Dartmouth graduate student in ecology and evolutionary biology, dreamed of becoming an animal. “I realized pretty early on that that’s not really a possibility,” Brown said. The Rauner Special Collections Library has partnered with the Dartmouth LGBTQIA+ Alum Association (DGALA) to launch SpeakOut, an oral history project in which faculty, alumni and students are interviewed regarding their experiences with the LGBTQIA+ community on campus. Cindy Yuan ’22 was on a road trip for a sports competition when she spotted something rather different in the landscape from what she was used to back home in California. “When we drove past all the yellow and orange mountains, I was awed,” Yuan said. It is not every day that people get to see their idols face-to-face. But for Shannon Sartain ’21, that was her reality when she had the chance to meet Rebecca Moore, who works on the team of creators of the Google Earth Engine, at the Google Earth Engine User Summit this summer in Dublin, Ireland. “I was so starstruck by her,” Sartain said.